Cornell iGEM’s OxyPonics system is designed to maximize the practical capabilities of our powerful biosensor using Wetlab’s engineered redox sensitive proteins. Focusing on industrial hydroponics, an industry critical to the future of food security and urban revitalization, we developed a system so that farmers could better control the environmental conditions crucial to their businesses. Farmers currently only control for the pH and nutrient content of their water. Our three-part system with bacteria, sensor, and Internet of Things (IoT) hardware integration allows farmers to optimize crop growth by manipulating a variable currently unheard of in the industry today: oxidative stress. If farmers today want to optimize for their redox environment, the only option on the market is using expensive and ineffective oxidation-reduction potential (ORP) probes, which are not specifically designed for this application. These expensive electrode probes constantly need maintenance and are only occasionally used to ensure that the levels of ROS (reactive oxygen species) are not extreme enough to be harmful to their crops . In addition to being expensive and fragile, these ORP sensors can only take a measurement at one point out of large deep-water systems and require the farmer to manually take measurements . Our solution, OxyPonics, is able to measure and respond to the oxidative stress in the water by adjusting the redox environment to optimal growing conditions completely autonomously. We change water conditions depending on the crop variety and stage of growth. This allows for larger, healthier crops, and the ability for farmers to expand their operations and compete with traditional soil-based farms. Our dashboard takes in external sensor data and automatically generates alerts and reports, enabling farmers to track real time data on their facility. Through further testing and certification, the OxyPonics system has the potential to become an industry standard in hydroponics, much like current automated systems for pH and nutrient levels. The hardware of the OxyPonics system is not a replacement, but rather an integrable system that consists of an optical sensor to detect the plants’ aquatic environment, a railing system to transport the sensor throughout the tank, and modified planter cups to safely hold the bacteria close to the plants. 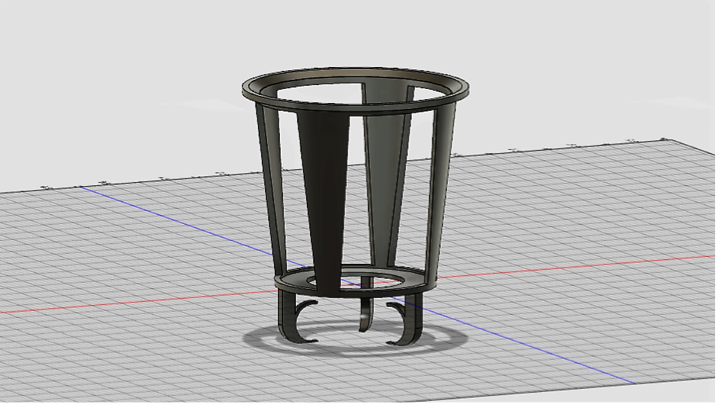 In order to incorporate the bacteria into a typical hydroponics setup, modified planter cups were designed using the CAD software Fusion 360. Since we desire to monitor and adjust the oxidative conditions of each plant, the bacteria had to be placed in the vicinity of each plants' roots without directly contacting the plant. Although the strain of E. coli we are using is not pathogenic, we designed a containment system to ensure that the E. coli never enters the hydroponics bed. This is due to the public’s negative perception that all E. coli can harm humans so the bacteria should never contact our food. To design around these constraints, the bacteria was put into rings of dialysis tubing, a selectively permeable membrane, which would allow the water to move between the plant and bacteria while keeping the enzymes in . Each modified cup consisted of three hooks along the outside bottom rim of traditional planter cups. The ring was then held securely in the hooks. The hooks were designed so that the bacteria tubing could be easily replaced once depleted. In order to measure the redox potential across an entire area with spatial precision, we used a simple, cheap camera. A 600 nm long-pass filter blocks out the fluorescence excitation light, ensuring the only signal measured is from rxRFP emission . The camera is mounted on rails with two degrees of freedom. A script on the connected Raspberry Pi utilizes these cameras to determine where areas of interest exist in the hydroponic bed. For more on the characterization of fluorescent proteins using our camera system, see Software. The bacteria are illuminated by light from 576 nm and 448 nm LEDs, passed through filters to clean up their spectra and avoid accidental activation of pDawn . We measure the ratio of excitations at these wavelengths, and compare it to a standard curve in order to determine the redox potential across the image. The railing is placed along the bottom of a traditional deep water culture tank and is used to mount the sensor enclosure. This enclosure utilizes a clear aperture and servos to maximize the exposure area of the light module when it is determined that the pDawn needs to be activated. The mobile part of the railing system is clipped along the side of the deep water culture tank, without contact with the body of water. The wheels are in contact with the outer wall of the tank and will be operated by a motor that can be controlled manually. The bars connected with the mobile area of the railing system will be crossing each other underwater, connected with a mount with a cross-shaped slot that allows it to travel along with the movement of the wheels outside the tank. The location of the camera will be known by keeping track of the distance the wheels traveled from the origin, which is the center of the water culture tank. A waterproof case that hold the sensor will be attached to the mount and move across the tank as the mount moves with the rail. Each tank gets a single Raspberry Pi. 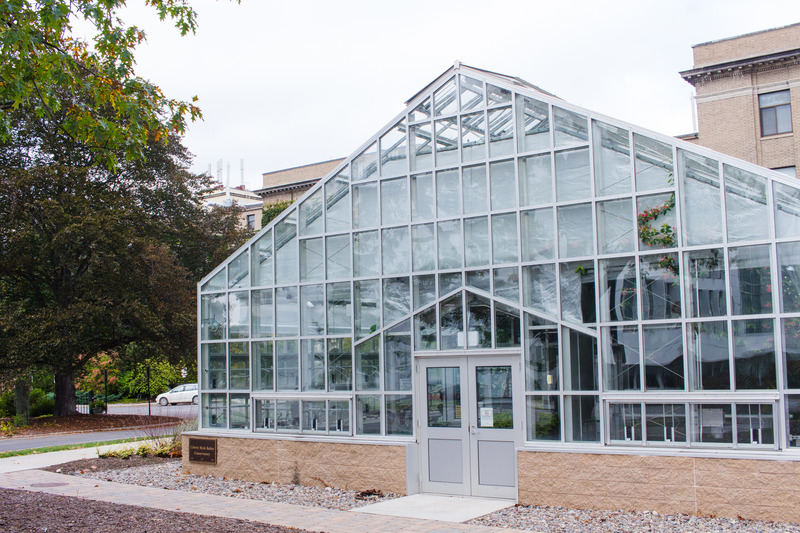 The Raspberry Pis are all connected to the local internet network present in the greenhouse via Ethernet, because wireless signals do not travel well in water . Data is uploaded to the central server as it is generated to provide farmers with accurate data. OxyPonics’s mechanical component went through several tests to ensure it properly read and activated the essential bacteria. First, the camera needed to be calibrated to the fluorescent bacteria by picking up and record bright spots in its field of vision. Next, fluorescence readings were normalized so that background light could be separated from actual rxRFP-fluorescence due to oxidative stress. This ensured we had applicable and accurate measurements. Furthermore, we tested how watertight the waterproof casing was to ensure the casing would not leak under higher water pressures and long periods of time. 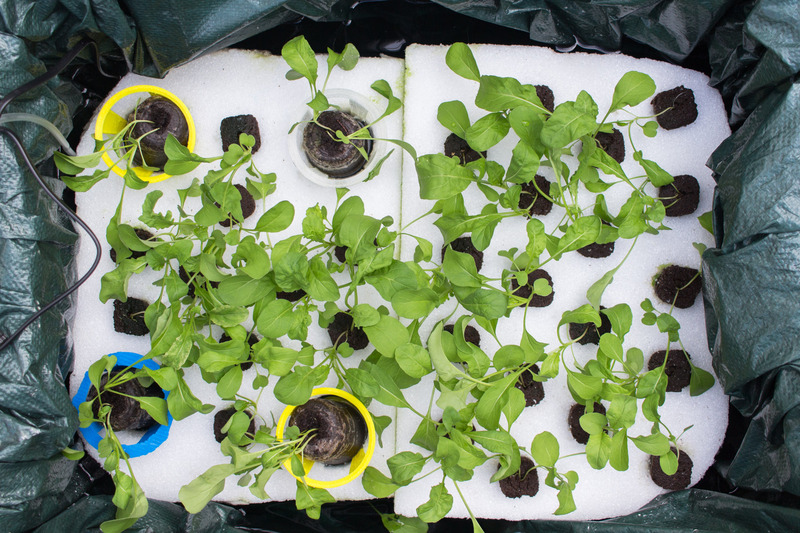 For the testing aspect of our project, we planted arugula seeds in growing medium, placed them in shaped styrofoam holders, and floated the plants in a 10 gallon bin filled with water. The bins were lined with a forest green tarp to ensure that our camera system was in blackout conditions. Germination of our control arugula seeds began near the end of September and the germination of the tested arugula seeds began in the beginning of October. For running tests with bacteria, the engineered bacteria will be housed inside of dialysis tubing, which will then be inserted into the holding hooks at the bottom of the planter cups. Our camera system will be waterproofed and placed inside the tanks to record data. After trials are run for 3 weeks, the plants will be removed and measured for dry biomass. In addition, ROS assays can be done to test for reactive oxygen species in the plant itself. Using feedback from hydroponic farmers, we’ve designed a functional way to monitor and display important information about the plants’ environment, providing our users with technology that is simple and easy to use. The dashboard’s primary purpose is to provide an easily accessible platform that displays information about the hydroponics system’s environment in real-time. The dashboard will have the capabilities to monitor pH, electrical conductivity, temperature, and oxidative stress, and alert farmers immediately of any imbalances in the system so that they can mitigate any harm to their crops. In order to amplify the impact of this software system, the dashboard will be multi-platform so that it can work on any operating system, including Android, iOS, and Windows. The dashboard provides farmers with real-time data on the state of their crops around the clock. Unlike current automation systems, OxyPonics measures both oxidative stress and other standard variables monitored in a plant’s environment, allowing for better control and improved yields. Once there is a change in the hydroponic system, the dashboard will notify the farmer and give them the opportunity to change any necessary settings at their convenience to ensure their crops are growing in a robust environment. The system operates similarly to competitive systems, but incorporates additional features and is redesigned for a farmer’s perspective. We designed our product with farmers in mind by making a system that is more user friendly than existing dashboards and easier for growers to read analytics and locate specific growth issues. Since farmers struggle to navigate through current dashboards, stats and graphs are allocated into separate tabs to prevent any clutter of various analytics. Each measured variable in the crops’ environment is visually distinct from other measured data. With its capability to provide instant analytics, the dashboard offers incredible functionality and versatility with more data presented in a simpler and friendlier form for hydroponic growers. In addition to instant analytics, the dashboard provides farmers instant updates on the state of their crops at any time and allows for immediate action to be taken if necessary. The dashboard compiles data collected behind the scenes and translates it into reports. In our interviews with farmers, they wish to have all types of analytics and documentation available, but they prefer to display only specific analytics. Other systems tend to show stats, graphs, and reports aggregated together, which makes it difficult for farmers to quickly go through the information presented. The Oxyponics dashboard not only separates reports from the statistics, but also displays each analytic in its own respective tab. Abundant information can be useful to have, but it can be overwhelming for users. Our dashboard allows farmers to choose what they see on their dashboard, reducing time wasted searching for certain data and increasing efficiency to run their businesses successfully. To make the software easily accessible to farmers, the system's dashboard has multi-platform support. Working on all devices including iOS, Android, and Windows, the system can be smoothly integrated into devices that are familiar to farmers. Because our dashboard is also available on mobile devices, farmers can monitor their plants even when they're outside their greenhouses. In the future, we hope to improve OxyPonics’s ease of installation, accuracy of absorbance readings, the duality of the bacteria, seamlessness of wiring, and our camera’s proprioception. Currently, Oxyponics’s devised rail system requires the hydroponic farmer to have a specific set-up with specialized trays and pliable tubs. The rail system is tedious to install and requires a large amount of initial labor. We hope to devise a sleeker rail system that requires less initial set-up in the future, and install a way to track where our camera is located within a tank. OxyPonics’s ratiometric output needs future improvements. OxyPonics currently uses normalized absorbance readings to avoid background noise affecting the amount of administered pDawn-activating light. More testing could be performed to further gain insight and understanding about the characteristics that our fluorescing bacteria present in hydroponic settings. Also, a better internal system for measuring the absorbance of the bacteria could be created. Additionally, the wiring of OxyPonics movable camera needs to be seamless and waterproof. As of now, the camera’s wiring is cumbersome and obstructive. The wiring’s position and slack makes the camera error prone to jams and pinching. Also, the wires connections to the camera mount present possible areas of water leakage. Both the sleekness and compactness of the camera’s wiring could be improved, and the wire junctions could be further waterproofed. Lastly, we hope to advance our camera’s proprioception in order to achieve more precise readings for individual tanks. Our cameras current software and wireless connection are low-grade, which reduces the cameras self-awareness of its position. One day, we plan to install a cost-effective wifi-router into our device along with better location software. Both of these upgrades will increase of camera’s proprioception and enhance how genuine the data presented to the farmer is. Suslow, T. V. (2004). Oxidation-Reduction Potential (ORP) for Water Disinfection Monitoring, Control, and Documentation. University of California Division of Agriculture and Natural Resources. 8149.